ASTANA --- Paramount Group, a South Africa-based global defence and aerospace company, operates in countries in the Middle East, South America and Africa. 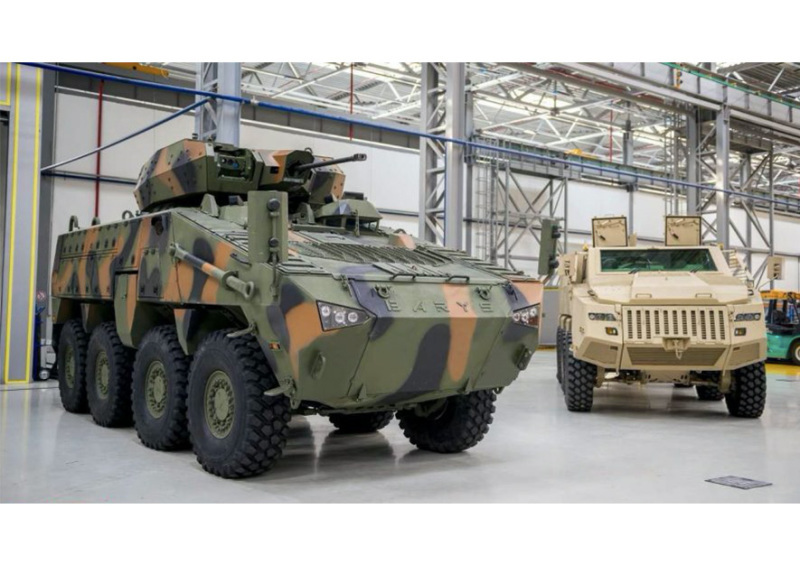 Its joint venture Kazakhstan Paramount Engineering (KPE) produces advanced armoured wheeled vehicles, such as the Arlan 4×4, Nomad 4×4, Barys 6×6 and Barys 8×8, in the country. Paramount founder and executive chairperson Ivor Ichikowitz recently spoke exclusively to The Astana Times on KPE’s further land, maritime and aerial production line expansion, which was announced in September at the 2018 Africa Aerospace and Defence Exhibition. KPE’s Astana factory has become one of the world’s most advanced military equipment factories and part of Paramount’s global supply chain. “Over the two to three years that the factory has been operating, we have trained a very capable workforce with levels of efficiency and quality that are as good as, if not better than, our production facilities around the world. It is natural that we would eventually be in a position to incorporate our Kazakhstan production capabilities into our global supply chain,” said Ichikowitz. This incorporation translates into the factory’s increased capacity so that it may serve both domestic and international demand. Kazakhstan is thus poised to become a competitive exporter in the global defence and aerospace industry. “Many people are under the impression that you cannot be competitive in export businesses in Kazakhstan due to the challenging geography. We’re in the process of proving that that is not the case. The logistics are problematic but can be overcome if you have a high-level technology product with sufficient value added in Kazakhstan,” he added. KPE’s facility has excelled in both quality and efficiency, standards that are non-negotiable because people’s lives depend on them. “Our products’ build quality takes many years to perfect. The quality of human capital available in Kazakhstan is such that KPE truly gets the concept of finessing quality. We also have the right mix of skilled operators producing quality products and, at the same time, not compromising on speed of production. We are very pleasantly and positively impressed by what our team in Kazakhstan is able to achieve in comparison to what we are able to achieve elsewhere in the world,” he noted. KPE currently produces the Arlan 4×4, a localised version of Paramount’s Marauder 8×8 used by many defence and peacekeeping forces worldwide. The Barys 8×8 has undergone rigorous testing primarily in Kazakhstan, with involvement from Kazakh customers and armed forces who helped in refining the vehicle and its technology based on real world operational experience in a harsh climate. “It is our intention to migrate more technology into Kazakhstan’s production factory. At the moment, our focus is on armoured vehicles. Next, we are probably going to focus on unmanned autonomous systems,” he added. Defence industrial capability is a key driver of broad industrial development. In building a strong foundation, a country also develops its human capital and fosters a culture of innovation. “For Kazakhstan to truly industrialise and develop an alternative to its oil-driven economy, it needs to develop a culture of innovation. We do that extensively in the defence industry and that will rub off. That takes time, but through cooperation with universities and research institutes and by proving to both Kazakh industrialists and the global market what can actually be achieved in the country, you create a new impetus for its industrialisation,” he said. Ichikowitz finds many countries that are just beginning to embark on a path of industrial development often exhibit self-doubt. “I think that the biggest benefit that a strong, visible defence industrial capability brings to Kazakhstan is a complete rubbishing of this concept that the country doesn’t have the ability to become a strong defence industrial country. I can tell you that Kazakhstan is up there with the best in the world in terms of capability; all that is missing is a strong sense of self belief,” he said. The upcoming production line expansion will contribute to Kazakhstan’s industrial development in a number of ways. “My vision has always been to use our industrial capability, intellectual property and innovation culture to contribute to the growth and development of the countries in which we operate. Kazakh President Nursultan Nazarbayev had a remarkable vision to not only make Kazakhstan independent as a defence industrial nation but, through the defence industry, to also demonstrate to other industries what is possible,” he said. For Ichikowitz, KPE is a physical manifestation of the President’s vision, with several factors contributing to its successful execution. “Kazakhstan sits in a geopolitical situation where there are strong defence industrial forces on its borders. You have Turkey, China, Russia and Europe. Step one was the President’s statement that we value these partners but need our own domestic capability,” he noted. Steps two and three were internalising and fulfilling the idea that “in order to be a defence industrial player you have to build your own platforms, hence the establishment of KPE,” and trust-building among foreign partners and the Kazakh government. “The fourth factor is that we were able to secure superb Kazakh management, which is experienced, committed and understands how to navigate the complexities of the Kazakh bureaucracy,” he said. “We were able to find young Kazakhs who were driven to become the best of the best in the world in what they do. Young Kazakhs are driven, motivated, capable, intelligent and well educated, so I would say to you that one of the major assets that Kazakhstan has is an education system which delivers people with the right skills to be trained into these sophisticated industries,” he said. Last but not least, another driver of success is that the government created an enabling environment for defence industrial businesses’ sustainable growth. “Despite that there have been budget cuts in Kazakhstan due to the economic downturn, it does not matter. It will simply take slightly longer to get to where we want to get to but the commitment has not waivered. These are the kinds of factors that make engagement with the country very positive,” said Ichikowitz. This expansion will ultimately prove transformative for Paramount Group and Kazakhstan’s relationship. “We are no longer looking at our engagement with Kazakhstan as a purely transactional one; we see ourselves as long-term investors in the country and as growing with the President’s vision for the country’s industrialisation, which is inevitable. If nothing else, the downturn in the oil industry and the economic crisis that Kazakhstan has faced over the past few years absolutely go to prove that economic diversification and the country’s industrialisation are not optional,” he added.